I had just started home from work. Cruising on Wall towards Riverfront Park, I had the green light to cross Spokane Falls Blvd. A car was stopped in the far lane on Spokane Falls. As I entered the intersection, a pickup truck coming down the center lane on Spokane Falls did too. I locked up the brakes. The truck followed suit. After stopping my front tire was just off his bumper. I looked at the driver. He was an elderly man and I assume the passenger was his wife. He looked at me with an open-mouthed I-almost-killed-somebody look of horror on his face. Just to make sure I checked the traffic lights. I still had green and he had red. I looked back at the driver. His face was still frozen in that expression. I pointed at him and then at the red light. He gave no sign of recognition. He just stared at me with his immobile face. So I continued on. I didn't begrudge the lack of apology from him. Better no apology to me than one to my wife and kids. Steph and her friend fly a kite. How bizarre. Politico interviews Congressman Paul Ryan and they make an infomercial for P90X. WARNING: Visiting web sites listed in spam messages is dangerous. Do not try this on your computer at home. Do this on someone else's computer at someone else's home. 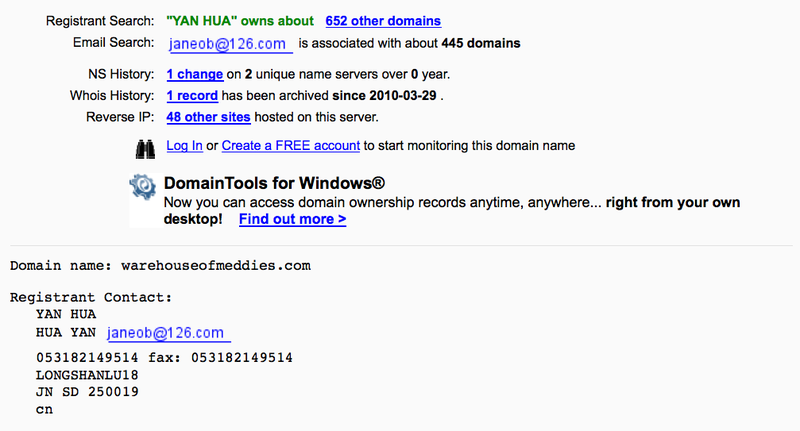 First I looked up the domain name which is owned by someone named Yan Hua who also owns about 652 other domain names. And is this person busy or what? 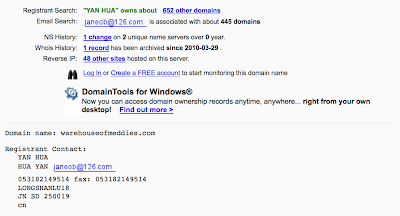 The domain name was just created yesterday. Amazing, this short-lived site already has 35,000+ satisfied customers. The site has a page of testimonials. That's a sure-fire way of telling if it's bogus or not. Ha! As if you're not convinced already, right? So I searched for similar testimonials. The links are on the phrases I searched for. Your services were everything advertised. And your prices were the lowest, by far. You have it all. I had serious doubts, that generic Viagra is as good, as the brand-one, but not only it is highly effective but also its much cheaper than the brand one! You have no idea how my wife and I are happy now :) Thx, one more returning customer for you. I will continue biz with u. According to McAfee, this and similar sites specialize in identify theft and credit card fraud. I kind of cheated last week (Shhhhh, don't tell Kathy) and instead of wearing shoes the entire week, I took them off each time I ran. I did 1/2 mile, 1-1/2 miles, and then 3-1/2 miles without shoes and without a problem. Today I ran 3 miles in the rain which is normally a lot of fun but the strong winds made running in one direction somewhat difficult. After my lunchtime run, one of my workmates asked if I had just run barefoot. She said she overheard two little girls outside the building asking their mother, "Why was that man running with no shoes on?" The mom explained to her daughters that some people think that running barefoot is good for them. Smart mom. A group of Climate-Change-denying Tea Party and Patriot Party members are gathering at Spokane City Hall for Earth Hour, March 27th from 8:30pm to 9:30pm. They will be shining flashlights and holding banners to admonish Mayor Mary Verner for advocating for environmental sustainability in Spokane. I thought this would be a great opportunity for Josh and Steph and asked them if they'd like to go. Josh thought about it for a while and decided he wanted to go but with a twist. He said that whenever there's an unruly and uninformed mob of people on South Park they always say "Rabble, rabble, rabble." He decided to make some signs and invite some friends to attend with him. On one side of the entrance to City Hall, Mike Fagan and a few Spokane Patriots, most claiming to be well-versed in the necessary sciences, held up signs and proceeded to badmouth the United Nations, climate change, sustainability and Mayor Verner. Oops, they mopped the floor with the flag they venerate. On the other side, an equal number of folks in support of sustainability and rational thought. Hey, Bart! After a bit, Josh and his two buddies held up their RABBLE signs and started saying, "Rabble, rabble, rabble." If anyone asked, they explained the South Park origin of their protest and said they were protesting the ridiculous nature of their [Spokane Patriots] protest. They also waved their signs at cars passing by. Although Steph came along, she only did so because I made her go after she tried to bail at the last minute. Not only was she glad she came, she was wishing she had made her own RABBLE sign. The scene got really tense for a while. Paul Haeder (on the right) was very aggressive both physically and verbally. He was obnoxious and didn't have a problem showing how well versed he is in the use of profanities. Mike Fagan (on the left) was spouting nonsense, but I didn't see him say or do anything to provoke anyone. A couple of people on both sides pointed bright lights and laser pointers at opposing faces. As you can see, Haeder got his nose scratched. I'm not sure what happened but he made it sound like he was assaulted. The Spokane Police showed up and everyone calmed down. The arguments that took place between people on each side were laughable in their futility to change the other's mind. The boys provided some lighthearted moments during the rally. Although they weren't on anyone's side, they enjoyed mocking the ridicularity of the Spokane Patriots. And from that The Rabble Rousers are born. The Review has a couple of articles about the protest. Opposing comments essentially mirror the arguments at the rally. The man who most aggressively confronted him carried an Earth flag. A former sheriff from a rural county in Arizona captivated a Yakima crowd of about 350 people Thursday night with the story of his evolution from a ticket-writing happy police officer to a libertarian crusader for Constitutional rights. Mack said America “is dying” and needs a movement to revive the Constitution. He said the movement must not be characterized by hatred or violence. Just check out their sites and you'll see how these groups really feel. You may have seen images like this. Members of the Westboro Baptist Church, a small church in Topeka, Kansas, are led by Reverend Fred Phelps who, for lack of a better characterization, is pretty much batshit insane. 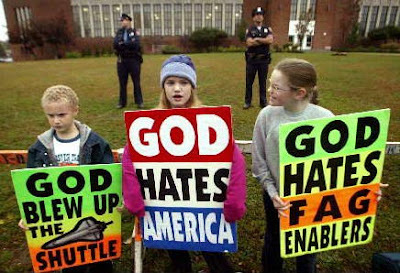 He takes members of his church, who are mostly family members, to cities around the country for anti-gay picketing. This young man has found the best answer for such a protest if it comes to a locale near you. This is the other thing I keep forgetting to call the Street Department about so I figure I might as well try SeeClickFix for it as well. It's on North Addison just south of Providence. Last night I got to listen to Steph and the rest of the choir sing at Northwood. They spent a long day in competition at Mt Spokane High School and last night they performed all the songs they sang for that. Die Meere is a sad, emotional and yet beautiful song. I'm not familiar with it but apparently it's about a woman who loses her husband at sea. I don't have any photos of men being lost at sea so I went with shots from the Wonderland Trail adventure I took with my brother John. Northwood Middle School Girl's Choir. There's a fascinating story over on Wired about a brilliant young man's criminal career. His career ended eventually, but he did some audacious stuff. The plane slowed and leveled out about a mile aboveground. Up ahead, the Viennese castle glowed like a fairy tale palace. When the pilot gave the thumbs-up, Gerald Blanchard looked down, checked his parachute straps, and jumped into the darkness. He plummeted for a second, then pulled his cord, slowing to a nice descent toward the tiled roof. It was early June 1998, and the evening wind was warm. If it kept cooperating, Blanchard would touch down directly above the room that held the Koechert Diamond Pearl [Sisi Star]. He steered his parachute toward his target. Every day I ride home past this and I remember that I forgot to call the Spokane Street Department about this sign. It's at the bottom of Lidgerwood/Mayfair just north of Foothills. It's a one-way for cars coming downhill and a two-way for bikes. The sign has been pushed into the bike lane and there's just enough room for a bike to get through. I keep seeing other cyclists take the risky route by going around the left side instead. I don't know if there has been an increase in traffic or a decrease in depth perception, but this sign has been taking a beating which is probably why it's intruding on the bike lane. Hopefully I'll remember to call tomorrow and get this sign moved back out. I'm no traffic engineer but it seems like there could be a better way of enforcing the one-way and allow for the bike lanes. Paul Dillon over at Down To Earth tipped me off to a site called SeeClickFix where you can report stuff like this. So I did. Thanks, Paul. Last night I took a break while I was working on that lengthy post and joined Kathy and Josh as they watched The Biggest Loser. So one contestant is about to weigh in and they cut away to an interview where he's expressing his concerns about how much weight everyone else lost and he says something along the lines of "I was hoping to get a big number, too." But the closed captioning displayed "I was hoping to get a big number two." "BWAHAHAHAHAHAHA", I burst out laughing. "You can get a big number two--Colon Flow!" Yeah...I guess you had to be there. ...and way less than double the amount. Washington State Attorney General Rob McKenna joined with 12 other state Attorneys General in a lawsuit claiming the recently passed Patient Protection and Affordable Care Act (big honkin' PDF) is unconstitutional. His site has a FAQ section about this and he states his reason for joining. This lawsuit is about ensuring that the federal government does not exceed its authority in certain provisions of the health care bill, and that the citizens of the State of Washington are given the respect that the Constitution requires. The Tenth Amendment states that “the powers not delegated to the United States by the Constitution, nor prohibited by it to the states, are reserved to the states respectively, or to the people.” In addition, under the Commerce Clause, never before has Congress required individuals to purchase a specific product. The health care bill requires that all Americans purchase or obtain health insurance in private commerce, and allows the IRS to fine those who don’t. The complaint filed in the case, 3:10-cv-00091-RV-EMT, within the U.S. District Court, Northern District of Florida is 23 pages long, but it immediately mentions that the Act exceeds 2400 pages as if that bears a significant legal ramification. Here are the alleged counts. under the Act, but have no choice other than to participate. 56. The Act exceeds Congress’s powers under Article I of the Constitution of the United States, and cannot be upheld under the Commerce Clause, Const. art. I, §8; the Taxing and Spending Clause, id. ; or any other provision of the Constitution. 57. By effectively co-opting the Plaintiffs’ control over their budgetary processes and legislative agendas through compelling them to assume costs they cannot afford, and by requiring them to establish health insurance exchanges, the Act deprives them of their sovereignty and their right to a republican form of government, in violation of Article IV, section 4 of the Constitution of the United States. 58. The Act violates the Tenth Amendment of the Constitution of the United States, and runs afoul of the Constitution’s principle of federalism, by commandeering the Plaintiffs and their employees as agents of the federal government’s regulatory scheme at the states’ own cost. 59. Plaintiffs reallege, adopt, and incorporate by reference paragraphs 1 through 53 above as though fully set forth herein. 60. The tax penalty on uninsured persons under the Act constitutes a capitation and a direct tax that is not apportioned among the states according to census data, thereby injuring the sovereign interests of Plaintiffs. 61. Said tax penalty applies without regard to property, profession, or any other circumstance, and is unrelated to any taxable event or activity. It is to be levied upon persons for their failure or refusal to do anything other than to exist and reside in the United States. 62. Said tax penalty violates article I, sections 2 and 9 of the Constitution of the United States. By its imposition of the penalty tax, and by the resulting coercion of many persons to enroll in Medicaid at a substantial cost to the Plaintiffs, the Act injures their interests as sovereigns vested with exclusive authority, except to the extent permitted to the federal government by the Constitution, to make all taxing decisions affecting their citizens and to confer a right upon persons in their states to make healthcare decisions without government interference. The tax penalty is unconstitutional on its face and cannot be applied constitutionally. through 53 above as though fully set forth herein. 64. The Act forces citizens and residents to have healthcare coverage or pay a tax penalty. In effect, the Act compels said persons to have healthcare coverage, whether or not they wish to do so, or be subject to sanction. The Act thus compels persons to perform an affirmative act or incur a penalty, simply on the basis that they exist and reside in the United States. 65. The Act is directed to a lack of or failure to engage in activity that is driven by the choices of individual Americans. Such inactivity by its nature cannot be deemed to be in commerce or to have any substantial effect on commerce, whether interstate or otherwise. As a result, the Act cannot be upheld under the Commerce Clause, Const. art. I, § 8. The Act infringes upon Plaintiffs’ interests in protecting the freedom, public health, and welfare of their citizens and their state fiscs, by coercing many persons to enroll in Medicaid at a substantial cost to Plaintiffs; and denies Plaintiffs their sovereign ability to confer rights upon their citizens and residents to make healthcare decisions without government interference, including the decision not to participate in any healthcare insurance program or scheme, in violation of the Tenth Amendment to the Constitution of the United States. 66. The tax penalty on uninsured persons under the Act unlawfully coerces persons to obtain healthcare coverage, thereby injuring the Plaintiffs’ fiscs, because many persons will be compelled to enroll in Medicaid at a substantial cost to Plaintiffs. As a result, the Act cannot be upheld under the Taxing and Spending Clause, Const. art. I, § 8. 67. In so coercing citizens and residents to have healthcare coverage, the Act exceeds Congress’s powers under Article I of the Constitution of the United States, and cannot be upheld under any provision of the Constitution. 68. Plaintiffs reallege, adopt, and incorporate by reference paragraphs 1 through 53 above as though fully set forth herein. 69. There is an actual controversy of sufficient immediacy and concreteness relating to the legal rights and duties of the Plaintiffs and their legal relations with the Defendants to warrant relief under 28 U.S.C. § 2201. 70. The harm to the Plaintiffs as a direct result of the Act is sufficiently real and imminent to warrant the issuance of a conclusive declaratory judgment clarifying the legal relations of the parties. I have one point about this being an unprecedented federal mandate. For the last 35 years every paycheck on mine has had federally mandated monies taken out to pay for Social Security and Medicare. Those who are convicted of willfully evading the insurance requirement can be fined up to $100,000 and imprisoned for five years. There's no mention of that in the lawsuit. I searched the 2407 page bill and found one mention of imprisonment. "(b) Any person that violates section 519 shall upon conviction be imprisoned not more than 10 years or fined under title 18, United States Code, or both.". This is Section 501 of ERISA that's being amended. (4) the regulatory status of such plan or other arrangement regarding exemption from state regulatory authority under this Act. This section shall not apply to any plan or arrangement that does not fall within the meaning of the term ‘multiple employer welfare arrangement’ under section 3(40)(A).". Nothing there about anyone "willfully evading" health insurance being subject to imprisonment. She's pulling that out out of her backside. 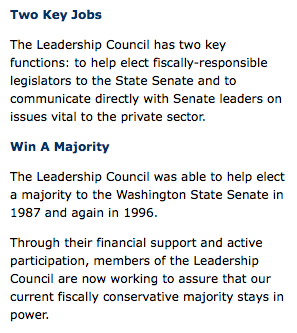 I received a message from the Washington State Leadership Council, an organization you can only join by invitation. The Leadership Council has two key functions: To help elect fiscally-responsible Republicans to the State Senate and to communicate directly with Senate leaders on issues vital to the private sector. They called with the "disturbing news" that Senator Chris Marr supported the Health Care Reform legislation. I'm to call his office and complain. I expressed my thanks in an email instead. I wonder who the council is referring to as "our current fiscally conservative majority"? Was the RNC not expecting President Obama to sign the Health Care Reform legislation? Only they call it the Pelosi Health Care Takeover. Here all this time I thought it was called Obamacare. 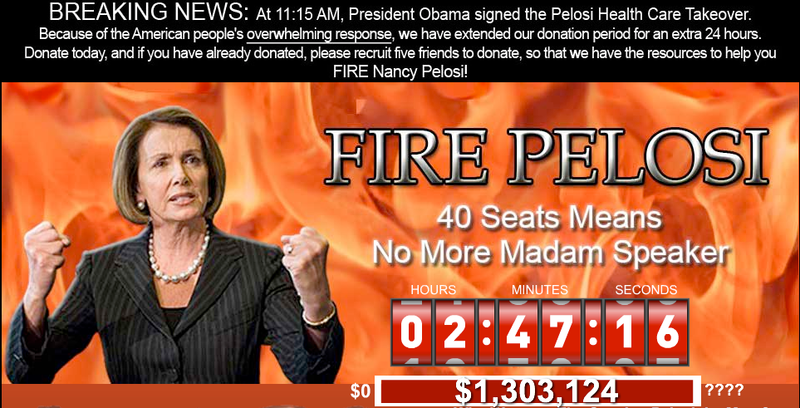 Nonetheless, the RNC is extending the donation period another 24 hours. Mo' money, mo' money! But when you think about it, they shortchanged themselves. At 6:30 this morning they still had five and one-half hours left. At 6:00 this evening, 11.5 hours later, they have nearly 15 hours left on the clock. That means 9 of the additional 24 hours have passed. So 14.5 hours on the clock went by in 11.5 hours. Instead of letting the first 24 hours complete, they reset the clock after 21 hours. Brilliant. I almost forgot...Those pythons are sick! In an attempt to take advantage of the furor instilled in and fanned by teabaggers, racists, constitutionalists, zealots and their ilk, the Republican National Committee came up with a web site to fire Nancy Pelosi and ask for money. Flexing her sick pythons, the tyrannical-looking Speaker of the House is made to look like she'll stop at nothing even while surrounded by flames. What man or woman among us can not tremble in fear while looking at this image of our strong-armed Speaker of the House hell bent on achieving Obama's goal of Socialism, Fascism, Communism, Marxism, Stalinism, and other pufferific-isms taking away our freedoms, rights, and liberties? My first instinct was to reach for my sidearm and double check my ammunition stock. 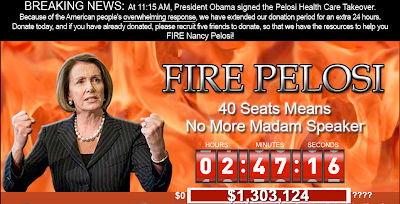 The countdown clock indicates when the fund raising ends. The goal is to reach $1,002,010. It took me a few seconds but that's a million dollars plus one dollar for every year A.D. 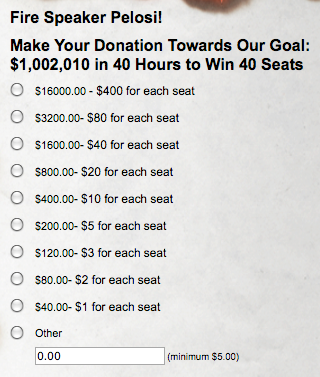 The RNC does the math for you so you can contribute an amount for each of the 40 seats they want to win. But there is a $5.00 minimum. No chump change for the chumps. This is the westbound lane on Buckeye just west of Washington. I need to find out if commercial vehicles are exempt in this type of situation. Three Saturdays ago I violated one of my rules while on a barefoot run. I ran somewhere that I hadn't scouted out beforehand. Consequently, I came up on some rocks and, in a sudden eye-foot coordination failure, nailed one particularly hard creating a very small, deep and well-defined blood blister just forward of the metatarsal area. I was telling Geoff about that during a video chat the following day and he struck this thoughtful pose with his hand to his chin and said, "Hmmmm, if only there was something you could put on your feet to protect them." Yeah, I think he gets that from me. Anyway, it was fine after a few days rest and the following Friday I did a four mile barefoot run without a problem. Then I hurt my other foot. The day after my run, two Saturdays ago, I was carrying something heavy--I'm normally barefoot around the house--and I had to take a rather long step down onto a hard surface. It was equivalent to stepping down from the third stair step. It didn't hurt at the time but as the day progressed I noticed some pain in the area of the second metatarsal. It gradually became severe enough to make me limp even with shoes on. There was no swelling or discoloration, but the bone felt very sore. So I've been wearing my sandals around the house, icing it a couple times a day and taking it easy. The pain has been nearly nil for the last couple of days so today was my first run in over two weeks. I wore my ragged running shoes and went easy for three miles. My feet felt fine but every once in a while I'd feel a dull ache in my left foot so I suppressed the urge to take my shoes off. I'll continue doing that this week provided the running does not cause any soreness. But all this leads me to question whether I'll be able to run the entire Bloomsday course barefoot. The longest distance I've gone without shoes is 4.5 miles. I was hoping to work into longer distances as Bloomsday approached and the weather improved. That's uncertain for now. I also bought some aqua sox to run in but, as with being barefoot, I want to make sure my feet are okay first. So I'll play it by ear for the next two weeks. Hopefully, at worst I'll be forced to do the first three miles of the race in aqua sox and the remainder barefoot. Colin Powell's take on preventing Iran from developing nuclear weapons. And from Senator Evan Bayh. Sen. Evan Bayh (D-Ind.) said Sunday that the White House needs to consider the use of force against Iran to keep the country from getting nuclear weapons. Bayh, speaking at a roundtable discussion on the opening day of the American Israel Public Affairs Committee conference, said that the administration should go through the motions of proceeding with planned tougher sanctions against the Islamic Republic, but cautioned that they probably wouldn't work and that the White House should be prepared for the worst-case scenario. "We need to go forward with aggressive sanctions that are likely to hurt the regime... but that's unlikely to work," Bayh said. "Now we have to turn to contemplate the final option -- the use of force to prevent them from getting a nuclear weapon." "...In the long run, you have to do what you have to do," he said. Maybe we could nuke Iran and then they'd truly understand why they don't want nuclear weapons. You know...since we're thinking so hard about this...in the long run. Every once in a while I check out Congresswoman Cathy McMorris Rodgers' Facebook page just to see what some rational people have to say before they're treated with derision by uninformed voters. Well, that's my take on it anyway. 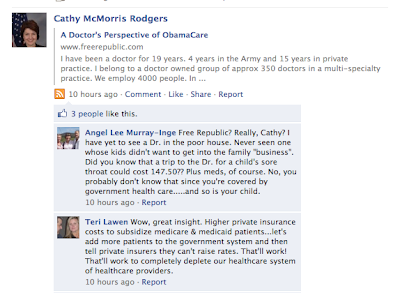 Today she posted a link to an article purportedly written by a doctor who gives his or her perspective of "Obamacare". It's published on the Free Republic web site. The author's name is not given, only the user name "schwingdoc". Do these people know what schwing means? Last week I wrote about the FCC's testing of broadband connections. Check out this entry from the Broadband.gov blog about how things are going so far. Thanks to the over 150,000 unique users who have taken over 300,000 Consumer Broadband Tests, as well as the nearly 4,000 addresses submitted to the broadband Dead Zone Report. The popularity of the consumer tools has exceeded our expectations. The FCC chose to use two testing applications for the Beta version of the Consumer Broadband Test. The two applications are among the most popular on the Internet and the FCC hopes to make available additional testing platforms in the future. However, software based broadband testing is not an exact science and contains inherent variability, as described in the About section. You will see that Ookla provides a higher overall average and median speed than M-Lab. This is likely due to the different methodologies these testing applications use. The difference comes from the fact that broadband speeds vary over time, even within a single second. Ookla measures peak performance and ignores short periods of slow speed, which it considers to be speed bumps in performance, while M-Lab takes many rapid speed measurements and averages them all. For more detail, see the Ookla and M-Lab methodology sections. Additionally, Ookla and M-Lab each have testing servers geographically distributed across the country. Individual’s proximity to these testing servers could also affect testing results. If you haven't done so yet, make sure you test your connection. Today Kathy received a letter with no return address on it. It was mailed in Spokane yesterday. The printed address had a late-elementary-school look to it. Inside was what appears to be a folded newspaper article with a yellow sticky note addressed to Kathy. As you can see, two different handwriting styles on the note. The top one is the one used on the envelope. Nearly the entire page is an advertisement for some sort of credit relief. It's definitely not from a newspaper. You're hard pressed to find a page from a newspaper that doesn't have the paper's name on the top or bottom. So who is this mysterious "C"? But C saved thousands... of... lives? Or dollars? 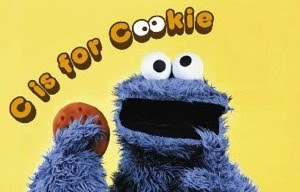 Or cookies maybe. I have no idea. But the ad on the paper wants us to contact one Jack Tenold of First Priority Financial in Spokane. Going through the rest of the staff, I don't find a "C". I really hate to pass up saving thousands, especially if it's cookies. Not that anyone is paying attention. We've been constantly bombarded with innuendo that Obama is a Marxist, a Socialist, or a dictator who wants to establish a Gestapo-like force to take over the country. Lines and arrows are drawn showing how everyone Obama was associated with and everything he does is leading towards his goal of seizing absolute power. Guess who wants to give the president some absolute power? The Enemy Belligerent Interrogation, Detention, and Prosecution Act of 2010 is a bill introduced by Senators McCain, Lieberman, Inhofe, Brown, Wicker, Chambliss, Lemieux and Vitter. It is currently being reviewed by the Senate Committee on the Judiciary. This particularly egregious piece of legislation would grant the president the power to lock a person away in military custody indefinitely and quite possibly in secret as well. It's not very long or complex and I invite you to read the entire text for yourself. First they reference a category of person called an unprivileged enemy belligerent. Whenever...an individual is captured or otherwise comes into the custody or under the effective control of the United States who is suspected of engaging in hostilities against the United States or its coalition partners through an act of terrorism, or by other means in violation of the laws of war, or of purposely and materially supporting such hostilities, and who may be an unprivileged enemy belligerent, the individual shall be placed in military custody for purposes of initial interrogation and determination of status in accordance with the provisions of this Act. Note that (B) references a catch-all known as "material support". There is a case before the Supreme Court in which the plaintiffs hope to get a better and more reasonable definition of that term because, as you can see from the linked story, the administration's definition is extreme. They also create a sub-category of high-value detainees who will be interrogated by a special group. (1) INTERROGATIONS TO BE CONDUCTED BY HIGH-VALUE DETAINEE INTERROGATION GROUP- A high-value detainee interrogation group established under this section shall conduct the interrogations of each high-value detainee. High value or not, they will not receive a Miranda warning advising them of their Fifth Amendment right to remain silent, against self-incrimination, consult with or have an attorney present, and have an attorney appointed free of charge if they can't afford one. A lot of people reading this may think this sounds reasonable so far, especially if they are envisioning the evil, leering Al Qaeda terrorist bent on the destruction of America. So they may be comfortable with said terrorist being imprisoned by the military, interrogated by a special team, and not being advised of what is commonly referred to the Miranda warning. But they're not done yet. And there you have it. If any person, including an American citizen, is a suspected unprivileged enemy belligerent, they will not be advised of their rights and they will be interrogated as we see fit. Any person, including an American citizen, designated as an unprivileged enemy belligerent can be imprisoned without charges or trial indefinitely. Eight conservative senators are willing to grant such power and authority to the president. The Washington State Legislature passed a bill toughening the restrictions on cell phone usage while driving. But does it really do what it's intended to do? First, let's look at some some reports containing remarks from legislators and law enforcement officials. "Maybe now people will pay attention to their driving instead of their conversations," Sen. Tracey Eide, D-Federal Way, and sponsor of the bill, said in a prepared statement after the vote. "Our roads will be safer and I believe lives will be saved as a result of this law." "Distracted driving is a very serious, real deal problem," said Rep. Reuven Carlyle, D-Seattle. "There's a public safety element to this that is very real." Officer Tim Moses with the Spokane Police Department says officers have waited a long time for a stricter cell phone law. "When you're going 60 miles-per-hour, and a car is moving hundreds of feet a second, and you're looking at your cell phone, and your not paying attention to that 4,000 lb. speeding bullet you're in charge of, you're looking at a cell phone, that's what's wrong," said Moses. Q: What does the Washington State Patrol think about this? A: They welcome it because they hope it keeps more drivers focused on driving. While state troopers are exempt, the WSP chief wants them to abide by the law as best as they can and to that end is trying to get them headsets. "The public-safety community really stepped up and convinced the legislators that were on the fence," said Rep. Reuven Carlyle, D-Seattle. "They deal with the carnage every day." In an editorial chastising the House for wanting to pass weaker legislation on the matter, the Seattle Times editorial board had this to say. Current cellphone rules are halfhearted because they make texting and talking on a handheld phone while driving a secondary offense. That means an officer has to have an additional reason to make a stop, such as weaving or a busted taillight. Many motorists flagrantly violate the law because they know the officer is unlikely to pull them over. The Senate, led by Sen. Tracey Eide, D-Federal Way, tried to improve the law, passing legislation that makes texting and talking on a handheld phone a primary offense. Simple, clear-cut rules of the road. Make the roadways safer by passing a law that actually persuades motorists to alter their dangerous, distracted driving. And from Senator Tracy Eide's blog. It's impossible to ignore - driving while using a cell phone is dangerous. The National Safety Council recently released a study stating that 28 percent of all accidents involve talking or texting on cell phones. Cell phone use while driving has been shown to be as dangerous as drunk driving. Research shows drivers who text are 23 times more likely to be involved in a crash. Even Oprah Winfrey - who calls distracted driving an epidemic that is claiming lives and destroying families across the country - has demanded an end to driving while using a cell phone. I encourage you to visit her website to see her powerful message urging drivers to stop using their cell phones. So let's have a look at the text of the bill (PDF). The restrictions for those with an instructional permit is spelled out quite clearly. As are the restrictions for those with an intermediate license. The holder of an intermediate license may not operate a moving motor vehicle while using a wireless communications device unless the holder is using the device to report illegal activity, summon medical or other emergency help, or prevent injury to a person or property. Notice that in both cases the person is not allowed to use a wireless communications device. Period. Here is the rule for those without an instructional permit or intermediate license. In this paragraph the offense is not for using a wireless communications device which leads to the distraction the legislators and law enforcement are concerned with, but merely the act of holding it to your ear. Bizarrely enough, the way this is written you don't even have to be using the phone. There are some exceptions. (d) A moving motor vehicle while using a hearing aid. (4) For purposes of this section, "hands-free mode" means the use of a wireless communications device with a speaker phone, headset, or earpiece. Notice the definition of "hands-free mode" doesn't necessarily mean your hands are free. You can use a speaker phone, headset or earpiece and still hold a phone in your hand. Clearly, drivers can still talk on and be distracted by their wireless communications devices. Changing it from a secondary to a primary offense makes good politics I suppose. But seriously, if we're so concerned with instructional permit and intermediate license holders using a wireless communications device while driving, which is certainly a distraction, then why not apply the same standard for the majority of drivers like they did for texting in this bill? Rather than addressing the distraction they claim to be worried about, these legislators are fooling us and themselves. This does nothing about Oprah Winfrey's proclaimed epidemic of cell phone usage while driving or the "carnage" wrought by a "4,000 lb speeding bullet". This only changes the appearance of the distraction and will possibly make earpiece vendors happy. A prayer offered up by the priest in church yesterday. "May those who commit acts of terrorism come to realize their actions do not reflect the true beliefs of Islam." With apologies to Lynyrd Skynyrd--if you're not familiar with the song you can check it out here--I offer up this for every cyclist riding in traffic. Right wheel tracking in my lane. Brought on my greatest of fears. They think passin' bikes is a game. Of making three lanes from two. And I'm lookin' out for you know who. Gimme three feet and go around. And we make it home safe and sound. So please don't make me squirm. And I'll go back to hearing this earworm. I pay my taxes, too. And this cyclist now was you. I can already hear it playing. Can't you? On the way home from the St Patrick's Day Parade yesterday, I asked Steph if she wanted to stop by a thrift store and look at albums. She was all for it. Ever since I bought her a Michael Jackson record she's been interested in ripping older music for her iTouch. The catch is that she doesn't want any music I recommend and already have. So I thought this would be a good opportunity for her to find something on her own and appreciate it. There weren't many records to pick from but this one caught her attention. 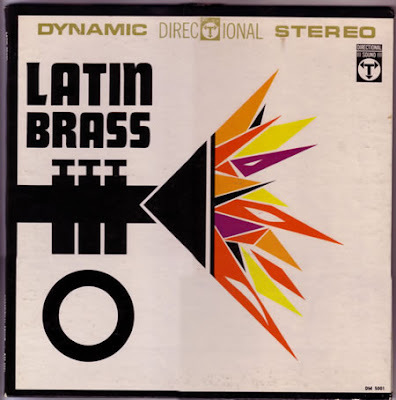 Latin Brass was recorded by John Evans and the Big Band. Yeah, I've never heard of them either. There's no date on it but it looks like it was released in 1961 since there's an advertisement for it in the Nov 6, 1961 issue of Billboard magazine. The "technical information" section on the album touts the three track recording tape used to make the record. Whoa! Three tracks! Last of all there's this for the audiophile who knows their record-making technology. The stereo master tapes are recorded to a stereo master acetate disc on a fully automatic variable pitch Scully Lathe using a modified Westrex 3-c cutting head. Well, that sold me right there. But aside from all that, the record is actually very good. I showed Steph how to wash a record and then we ripped the tracks to mp3 format. And now she is doing the cha cha. Steph and I went downtown to catch the parade. A piper was happy to pose with her. Nothing says "Irish" like a man in a gorilla suit riding a Russian motorcycle. Surprisingly, there is very little information to be found on this subject. Back in 2007, at Kathy's insistence, I finally had my hearing checked and received the word that everyone else already knew. I needed hearing aids which ended up costing me $3,000. It's been three years now and I must admit they have made a huge difference for me. It took a few months before putting them in my ears first thing in the morning became habitual. Getting my brain to relearn which sounds were ambient was a chore. Me: "Man, that cuckoo clock ticks really loud." Steph: "Dad, it's always been like that." And who knew water coming from a faucet could be so loud. But after some months, I adjusted and now I definitely notice when I don't have them in. Three years worth of batteries. Congress amended the Food, Drug and Cosmetic Act to give the FDA regulatory power over all medical devices, and the FDA followed with the Hearing Aid Rule of 1977. It required consumers to see a physician to rule out a medical problem before getting a hearing aid. It also created an exception: Adults could bypass a doctor if they signed a waiver administered by a state-licensed hearing-aid dispenser. By signing, customers would acknowledge that they understood the dangers of skipping a full medical evaluation. Today, two types of licensed specialists are the main vendors of hearing aids. State-licensed hearing-aid specialists need only a high-school education but have to pass tests proving their competence to administer hearing exams, fit devices and recognize underlying physical problems. Audiologists must have at least a master's degree, though they generally aren't medical doctors. After the FDA rule went into effect, audiologists changed their professional code of ethics and jumped into the business of selling hearing aids. Under standards set by professional bodies, the specialists require a battery of tests and fitting sessions, driving up the cost. That results in the $2,200 average cost for hearing aids, a figure cited in an industry study sponsored by Knowles Electronics, an Illinois components maker. I had my test done separately and it was covered by my insurance. The fitting sessions consisted of making molds of my ear canals and then making sure the hearing aids made from the molds fit properly. My hearing aid provider gave me the same answer of testing and fitting when I asked about the cost. When I remarked that a laptop computer has far more circuitry, capabilities, and power than a hearing aid and costs far less, he answered that chips are made for computers in far greater bulk than for hearing aids. I can't speak to that but it still didn't make me feel any better. And then he told me that mine were actually cheaper than they could have been. The reason is that my digital aids have twelve bands that can adjust specific frequency ranges. However, my twelve bands were combined to make four. In other words, the capabilities of my hearing aids were purposely reduced to match what I needed. The cost difference is in how the software controls the hardware, not a difference in the hardware. That's hardly a comforting explanation, but that's all I've got. What a coincidence, this very subject came up on Slashdot. ...who refuse to take crap from young punks. NSFW language and the Rocky theme is too loud. So where's your foot now, young man? The FCC is gathering information from broadband users to see what their connection speeds actually are. I decided to try it out. The next two charts reflect the speed I got from using Internet Explorer 7 on Windows XP running in a virtual instance on my iMac. There are two possible testing scenarios. One uses Ookla and the other uses M-Lab. The first tester is randomly selected and you are offered the chance to test again using the other, which I did. BTW, I'm a Comcast customer. These two charts reflect the results I got using Safari on the iMac. I wonder why the results differ so widely between M-Lab and Ookla. Last weekend I had a home project in which I removed the wall paper in the master bathroom which meant I had to apply texture to the walls before painting. Since the actual wall area is reduced a lot by a tub, window, shower and mirror, I decided go the easy route and use the spray can texture instead of hauling my neighbor's air compressor upstairs and going wild with a gallon jug of premix attached to a spray applicator. At Home Depot, the young lady at the checkout station advised me that she may need to ask me for my birth date in order to purchase the aerosol can of texture. That confused me which, as my nearly-double-digit number of readers know, is easy to do. My gray hair, gray beard and the occasional protruding-from-my-shirt gray chest hair hardly peg me for anything less than the grandfatherly aged. But Steph was with me. So I asked if she meant mine or my daughter's age. It was mine. The young lady explained that young people have been known to "huff" aerosal products and some products require a birth date at purchase. She scanned the texture. "Oh," she said, "I don't need your birth date." Nonetheless, I decided to be a good father. I showed the can to Steph and told her, "Don't ever breathe this stuff. It'll kill you." "No duh, Dad," with a "do you think I'm stupid or something?" expression and tone of voice. More 12 year olds have used potentially lethal inhalants than have used marijuana, cocaine and hallucinogens combined, according to data released today by the Substance Abuse and Mental Health Services Administration (SAMHSA) in conjunction with the 18th annual National Inhalants & Poisons Awareness Week. The need to increase awareness of this public health risk among physicians, parents and others cannot come too soon for Kevin Talley, the father of Amber Ann Suri, who died in February 2009 after huffing. Her parents suspected something was going on when they noticed she had a pungent smell, glassy eyes, and complained about sinus problems. Although she was taken to a doctor, her real problem was not identified and she was treated only for her sinus symptoms. She died shortly thereafter. 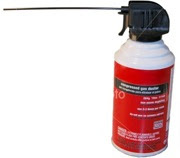 Young people sniff products such as refrigerant from air conditioning units, aerosol computer cleaners, shoe polish, glue, air fresheners, hair sprays, nail polish, paint solvents, degreasers, gasoline or lighter fluids. Youngsters intentionally inhale these substances to get high. Most parents are not aware that use of inhalants can cause “Sudden Sniffing Death” - immediate death due to cardiac arrest - or lead to addiction and other health risks. I remember seeing television reports of glue sniffing back in the 60's and reading about kids sniffing aerosol paint back in the 80's and 90's, so huffing is not a new problem. A 2001 brief from the National Drug Intelligence Center showed that huffing was on the increase in the 90's. According to the 2000 National Household Survey on Drug Abuse, the number of new inhalant abusers rose approximately 158 percent from an estimated 392,000 in 1990 to 1,010,000 in 1999. The primary user group was composed of 12- to 17-year-olds--over 636,000 had tried inhalants for the first time in 1999. This number is more than double that of the 18- to 25-year-old user group (276,000.) Almost 17 million individuals have experimented with inhalants at some point in their lives. Inhalants are the fourth most abused substances in the United States among eighth, tenth, and twelfth graders; alcohol, cigarettes, and marijuana are the top three, according to the 2000 Monitoring the Future Study. By the time adolescents reach the eighth grade, one in five has tried inhalants at least once. Prevalence of lifetime abuse has consistently been higher among eighth graders than among tenth and twelfth graders. In 2000, 18 percent of eighth graders, 17 percent of tenth graders and 14 percent of twelfth graders admitted having used inhalants at least once in their lifetime. Statistics showing higher lifetime use among eighth graders may be due to the fact that frequent inhalant abusers typically drop out of school and consequently do not participate in the tenth and twelfth grade surveys. That sounded pretty bad back in 2001 so I thought I'd take a look at the report being referenced by the news and issued by the Substance Abuse and Mental Health Services Administration. (The PDF version has more.) And there are even more charts here with a variety of breakdowns of the data. And there's even more data than you can shake a can of paint at in the 2008 National Survey on Drug Use and Health. And after reading it I had to ask, "Did the person(s) writing the press release of the news article(s) even bother to read this?" Inhalant abuse is actually on the decline. That's not to say that inhalant abuse doesn't warrant attention, but the way this is presented in the news you'd think huffing was rampant. So what gives? The first sentence in the SAMSHA press release is puzzling. The word "lifetime", as defined in the 2008 National Survey means used at least once, not for the rest of their lifetime. But either way, I can't find where that information comes from. So what's up with all the hype when the good news is that the abuse of inhalants is actually going down? Cathy McMorris Rodgers is serious about earmark reform--again. The big news back in Dec 2008 was that she was appointed chair of the Republican Committee on Earmark Reform. After creating this committee, Republican House Minority Leader John Boehner was not pleased that the Democratic House leadership's decided not to participate. “I’m also disappointed House Democratic leaders declined to appoint members to the Select Committee on Earmark Reform established by House Republicans, which will begin its work shortly – sadly, without the participation of any members of the majority party." The committee was supposed to release a report in Feb 2009. There is still no report today nor have they met once since February 2009. That doesn't mean they didn't meet before nor does it mean they did. But still, don't let that make you think Cathy McMorris Rodgers is not serious about earmark reform. That report was to be delivered “no later than Feb. 16, 2009,” but it still hasn’t come. While a Republican aide said earlier this month that the report is a “work in progress,” committee members acknowledge that they haven’t met once since their February deadline came and went. Imagine, if you will, what they would have accomplished if both parties participated and not attended the meetings not held. Could they possibly have done more than has been done already? Committee Chairwoman Cathy McMorris Rodgers (R-Wash.) has requested roughly $129 million in earmarks so far this year. Her staff defended her panel’s work, saying it has “inspired” a GOP website that lists all members’ earmark requests and also inspired “the Republican transparency initiative” that is being pushed now on Capitol Hill. But McMorris Rodgers’ staff and committee could not identify a single reform recommended by the group. Nor could earmark critic Rep. Jeb Hensarling (R-Texas), another member of the committee. In 2008, an election year, she voluntarily refrained from requesting earmarks for the year 2009. As you can see from the above quoted article she resumed requesting earmarks, but that doesn't mean she isn't serious about earmark reform. Thirteen months after the report that was never released by the committee she chaired that never held meetings that she never presided over, the House Appropriations Committee announced yesterday that it will no longer approve earmarks for for-profit companies. 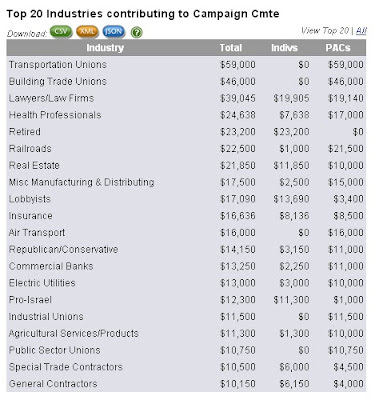 For-profit entities, such as large defense contractors, routinely collect millions in government dollars earmarked by members of Congress in the appropriations process — while their executives donate heavily to lawmakers' campaign accounts. The ban is intended to be a "long-term proposition," according to a committee news release. The pressure is now on House Republicans, led by Minority Leader John Boehner of Ohio, who are considering a more sweeping ban, seeking to regain the mantle of fiscal responsibility and capitalize on Democratic ethics missteps. Republican House members have made a decision. 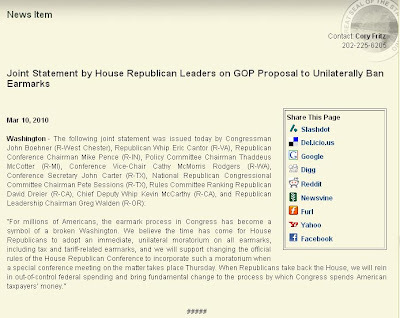 Mr Boehner released a statement, also signed by Cathy McMorris Rodgers. After all, she has been serious about earmark reform for quite some time. And the end of the statement is telling. And there you have it. Earmark reform is becoming an issue in an election year which explains why Cathy McMorris Rodgers is so serious about it--again.